I thought about calling this post “without a leg,” because I’ve been feeling that way — nothing solid to stand on — since I got off the ferry three days ago. Friday night was particularly bad. The ground seemed to rise up and drop away with every step, and I had to hold on to the hostel’s kitchen counter to keep myself upright. This prompted me to do what I should never do, which is ask the Internet what’s wrong with me. I called Stewart — he had just flown over me and landed in Fairbanks — to tell him I’d figured out the problem. It’s called mal de debarquement and it’s going to last for the rest of my life. Stewart reminded me about the hazards of Internet self-diagnosis. But I saw it in The New York Times. He told me to let it go and get some sleep, and I said okay. But I was still freaked out. It seems that sometimes — “the usual situation is that of a middle aged woman who has gone on a cruise” — the brain adjusts to being in motion and then can’t right itself on land. For some people, this land sickness lasts for days, for others, weeks — for an unlucky few, forever. My mom calls it “boat head” and tells me it will probably settle down after about the same number of days I was in motion. I hope so. It’s an eerie feeling, when the world is in a swoon. It makes me want to lie down and give up, which is exactly what I did on Friday — at least temporarily. I was glad to lie on my lumpy hostel bed for a few hours and listen to a guy weed whacking the side yard. I didn’t have the energy for anything fancy. 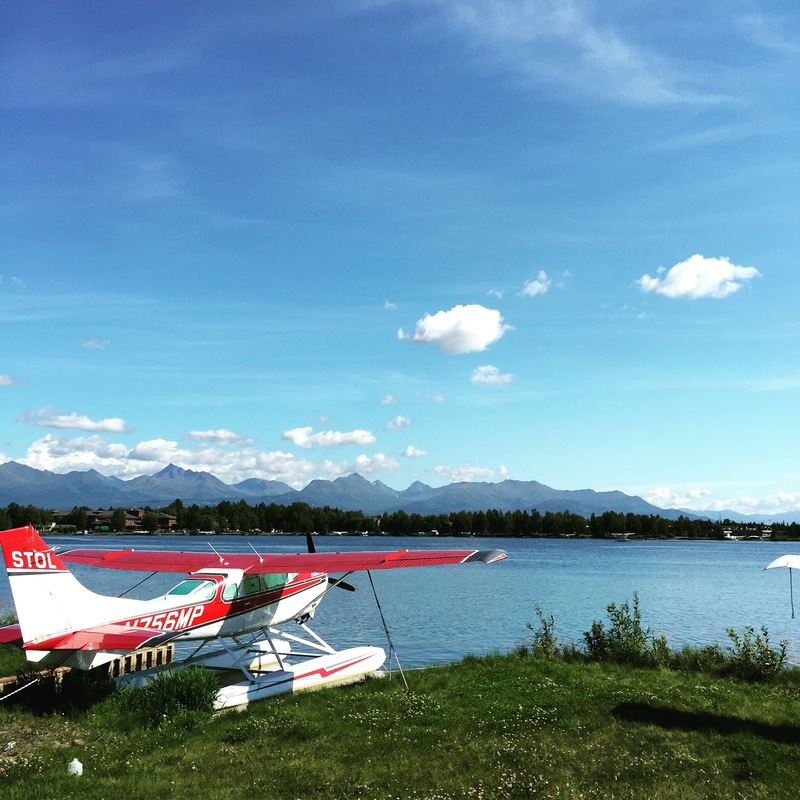 Later that day, I swayed around downtown Anchorage and took one of those ubiquitous trolley tours — IT’S NOT JUST A TOUR, IT’S AN EXPERIENCE — so I could see some places I wouldn’t be able to walk to, like Earthquake Park and the Lake Hood Seaplane Base. They say mal de debarquement improves when one is in motion, and that’s how it was for me. I was fine on the trolley and then fine again yesterday on the train. Today, now that I’m on supposedly stable ground here in Fairbanks, I’m woozy again — but I’m resolved that this, too, shall pass. In the hostel, I found a partial copy of Coming Into the Country. A dog had chewed it up, so I swiped it for the train. The point is — after ten days, 2,674 miles, two buses, two trains, five days on the ferry, and two more trains — I’m in Fairbanks. 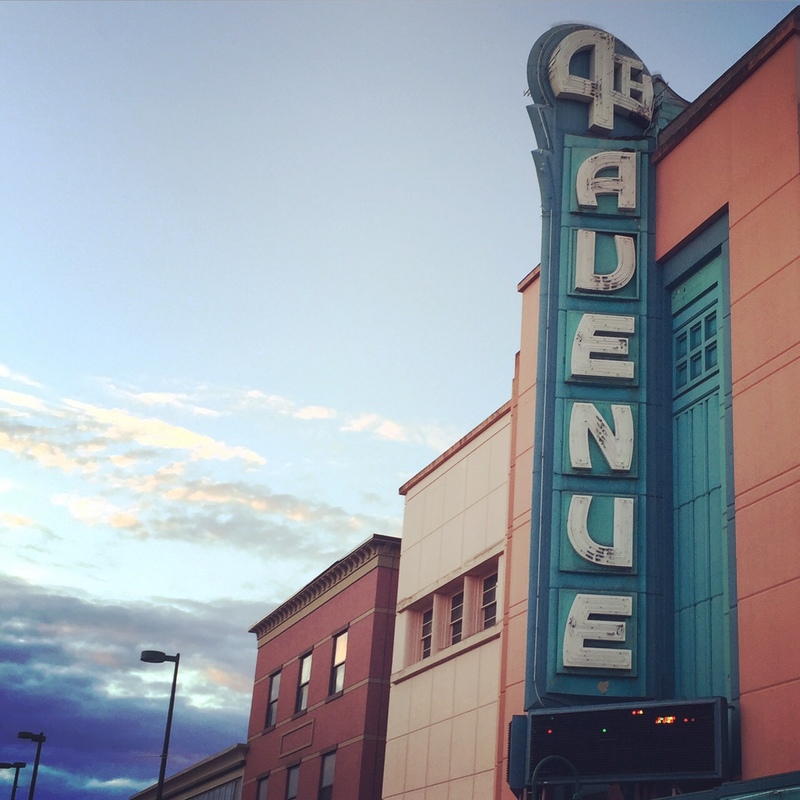 I boarded the train in Anchorage at 8 a.m. yesterday and arrived in Fairbanks twelve hours later. I’ve been on the Denali Star train before; this may be the fourth time I’ve done the leg from Denali to Fairbanks. 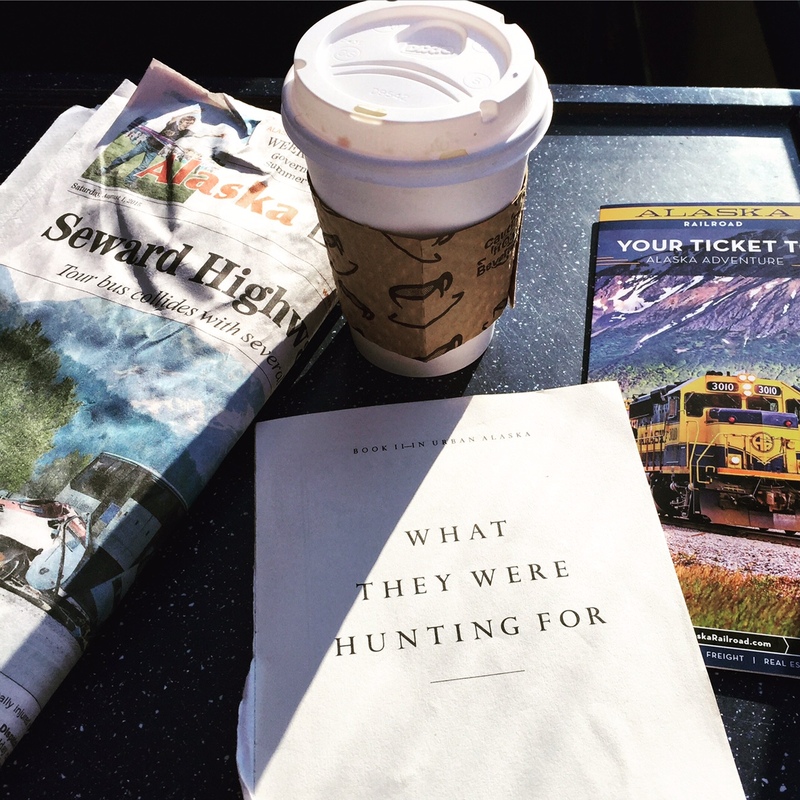 I had a theory about the train trip that proved true, which is that all the brightly colored people — anything neon and all flip flops – would be off the train by Denali. The rest of the ride was how I like it to be — serene and soft like flannel. We have a lot to do here in Fairbanks over the next few days. The plan is to head out to the cabin on Wednesday. I loved riding the train with you. Thank You! (want to know how you did those fancy titles et al ;-) ). Oh, gads and darn on the vertigo. I feel ya. I’ve had it after getting off a boat. Recover fast. Looking forward to more when you’re able. On the journey with you as I can. Thank you, Heloise. The video is thanks to the magic of iMovie. 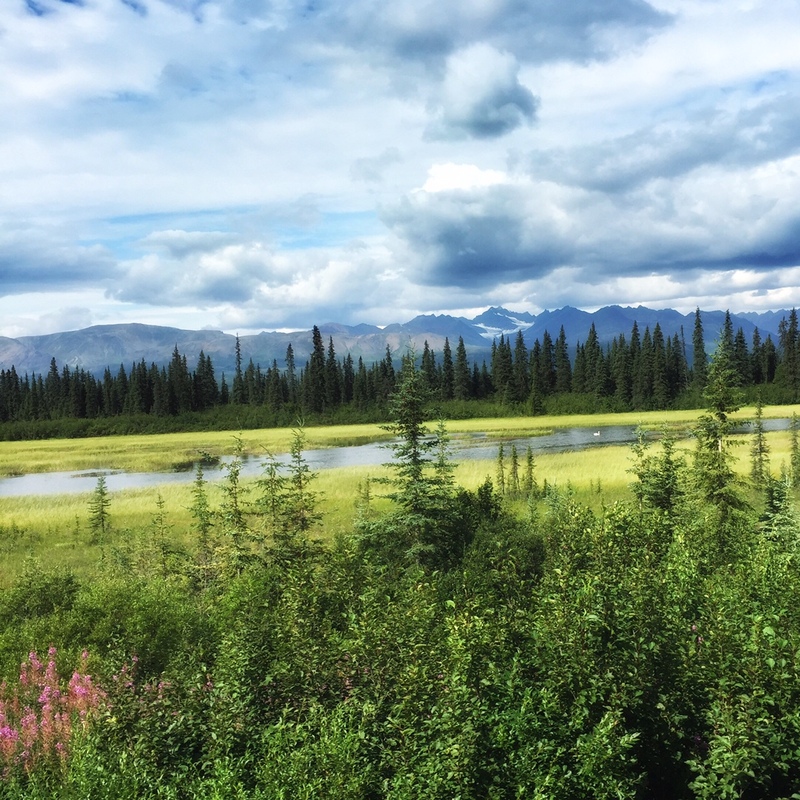 I was fiddling with it on the quiet part of the train ride between Healy and Fairbanks. It’s fun and pretty easy to figure out. Lovely rising the train with you, the music, the bridge, the gulch and the beautiful River. Do folks raft that river or is it just too damn cold? Hope your land legs arrive quickly. I’m pretty sure your reunion with Stewart was splendid! Xo….. In that canyon, we saw four big inflatable rafts full of folks. My head is getting better every day and Stewart and I are enjoying Fairbanks! I think the video was already spruced up by the time you saw it. The version that’s posted now is the third try — and probably as good as it’s going to get. Boat head is getting better, thank you. Hope you have a lovely August, Jane! Yes. I understand you, Denise.